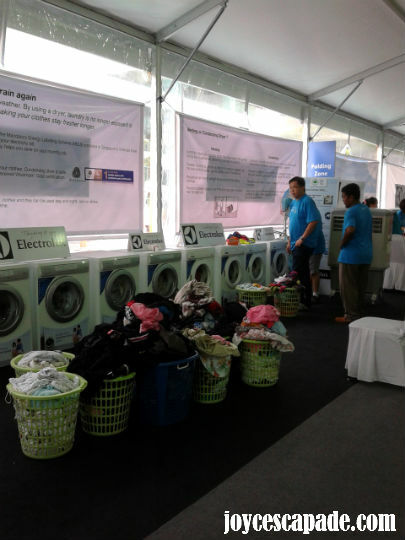 Malaysia's FIRST Outdoor Washing Marathon by Electrolux, i.e. 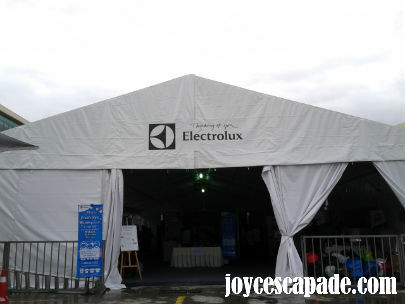 Electrolux Washing-thon, happened from 1 to 4 November 2012 at Citta Mall, Ara Damansara, Petaling Jaya. 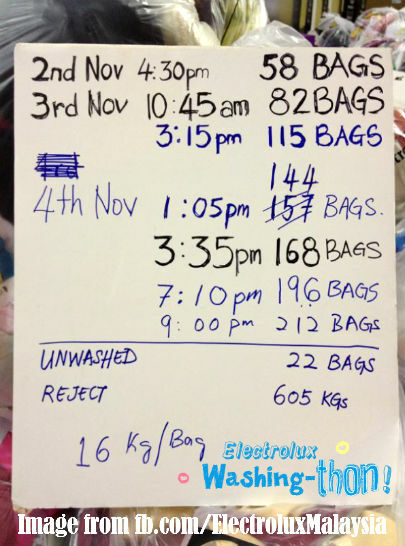 As seen on Electrolux Malaysia's Facebook page, they have collected and washed a total of 3,744kg worth of clothes over the last 4 days and have set a new record for Malaysia! These clothes will benefit 25 Orang Asli villages, four children homes, the homes for adults, the elderly and the destitute (Grace Home), and a center for the drug-dependent. I went to the event on Sunday, 4 November, also the very last day. 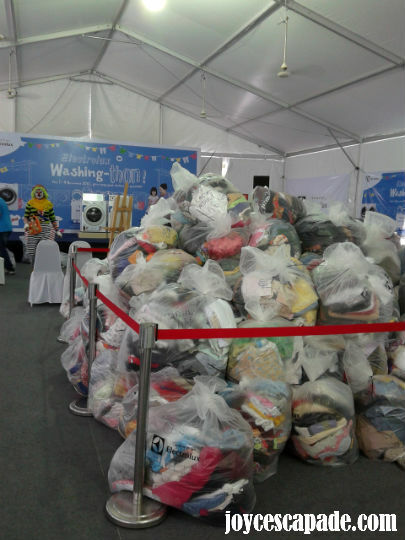 As of 3:35pm, they have washed, dried, and folded 168 bags (16kg per bag) of clothes. 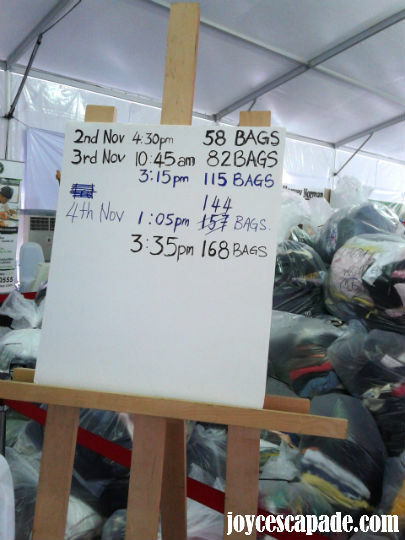 The final count (as shown in the first photo above) at 9:00pm was 212 bags! There were another 22 bags of unwashed clothes! Earlier on, my hubby and I have also donated some old clothes for this meaningful event. I wondered where were they in that huge pile of packed and bagged clothes. LOL! Volunteers at the Sorting Zone worked at their top speed to sort the colored from the whites. 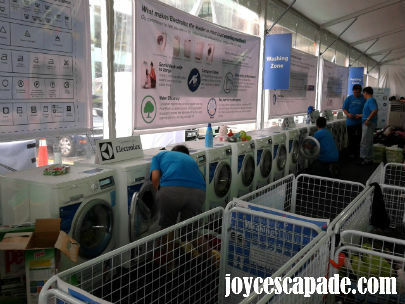 At the Washing Zone, I was very impressed to see a row of washing machines (maybe 20 of them), with clothes spinning in them. There were baskets and baskets of washed clothes too, waiting to be sent to the Folding Zone. To all volunteers, THANK YOU for volunteering your time and effort at the event. I believe, the underprivileged community will benefit from your sacrifice and act of kindness! Congratulations again for a job wonderfully done! Donated my old clothes for Electrolux Washing-thon! Note: The blog posts above, including this post, are not paid reviews. I wrote as an appreciation for Electrolux Malaysia's Corporate Social Responsibility (CSR) initiative to the society at large.